After the Big launch of iPhone 5, Apple now launched its next versions of iPhone. The new iPhone models are iPhone 5S and iPhone 5C. 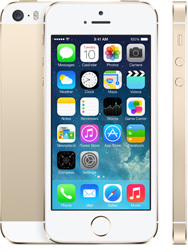 iPhone 5S is the high end model while iPhone 5C is a cheap option for iPhone lovers. After so many rumors and news updates, Apple finally announced the official launch of these two feature-rich smartphones. As of now, Google also going to launch its next version of Android named 'KitKat' which has earned a lot of exposure to Google and KitKat chocolates. It would be nice to see the competition between these two giants. Although, Google is already winning the war until now and the new features of iOS 7 are also being copied from Android. While Google has taken its mobile operating system to a very next level with the launch of Android 4.3. No matter what features both operating systems are offering there are always fans and addicts to both of them. So, for iOS and Apple lovers, who want to know details about the new iPhone models, this article will be helpful. 64 Bit Architecture: Most of you might be familiar with this term. This term mostly comes to play when you are installing a new Operating System. Now most of the computers and Laptops are 64 Bit powered. This gives higher speed and fast performance to computers. Same is just integrated in to the new iPhone. The iPhone 5S is the first smartphone to have 64 bit architecture CPU. Touch ID: Touch ID is a really great and most awaited feature in new iPhone. In older iPhone models such as iPhone 5, 4S or 4, you have to unlock your device each time you want to see a message, make a call or check Facebook or Twitter. And each time you want to do that you have to unlock your phone by entering specified password. This is much time consuming. Therefore, Apple introduced this new feature of Touch ID. Which enables you to unlock your device just by pushing the home button with your thumb. The touch ID can detect your fingerprints in all directions, means the angle, rotation doesn't even matter. Touch ID is capable of 360 degree capability. And not just that, you can also have multiple fingerprints on a single iPhone 5S, that means the people you trust can also unlock your device with Touch ID. New Colorful Cases: The iPhone comes with a great choice of colorful cases. iPhone 5S comes in these three colors: Silver, Black and Gold while the cases are available in Yellow, Beige, Blue, Brown and Black. You can choose any case according to your favorite color. Camera: 8 MP Back and 2 MP Front. iPhone 5C is the cheaper phone for them who want to enjoy the features of iPhone in a low cost phone. The look of iPhone 5C is even sexier than 5S. But iPhone 5C lacks in some features such as it has A6 chip while 5S has A7 and it also does not support Touch ID feature. The other features are same as iPhone 5S.